Lutheran Disabilities Ministries (LDM) invited us to document their ministries for learning disabled people. We filmed at their headquarters in Anderson, IN, where they are planning a permanent camp facility and at a Friendship Bible Study at a church in Indianapolis, where sponsors devote one evening to allow the handicapped to participate in a study and worship service. Finally, we taped over 18 hours of ministering activities to these beautiful people at one of LDM's week long HandyCamps . 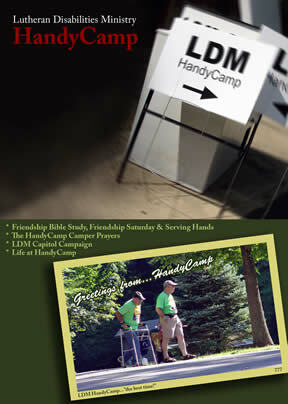 Segments covering HandyCamp, Friendship Bible Study, The Campers Prayers and others have been edited into the DVD for use by the Ministry to raise volunteers and funds for the Anderson Camp facility.